Engineered to be the largest and most luxurious steam ship in the world, the Titanic was truly a marvel of modern engineering. Deemed as virtually unsinkable, the massive Titanic was owned and operated by the White Star Liner and was registered at the Liverpool port. The Titanic was designed with the latest in technology and what they thought was the utmost of craftsmanship. Using the latest in technology and with a vision of grandiose things in store for it, the Titanic plans were introduced in 1909 and the ship was put into action on May 31st, 1911. Construction was headed by Harland Wolff shipyard in Belfast, Ireland and the Titanic was designed to be a bigger and better version of her little sister called the Britannic. Titanic construction was funded by American industrialist J.P. Morgan and ended up being 882 feet, 9 inches long and 92 feet wide. The titanic had the capacity to carry 3,547 making it the largest passenger vessel of its time. The ship came complete with every luxury one would want from a cruise liner. 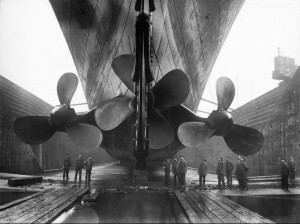 In only two years and two months, from keel to completion, the Titanic was ready for its maiden voyage from Southampton to New York City. More than 15,000 men were employed during the Titanic’s construction and historians believe that shoddy craftsmanship in some areas may have been the reason that the Titanic sank into the Atlantic during its maiden voyage. Although expected to use the latest in technological advancements, many historians have found that large quantities of slag were found in the rivets that held the Titanic together. Reports from Harland Wolff allegedly speak of a lack of skilled riveters available and it is thought that they simply settled for sub-par work. When the Titanic hit an iceberg on the night of April 14, 1912, it is believed that the hull buckled and the rivets holding the ship together popped right out. The sinking of the Titanic is an event that shook the entire world and still sparks interest today. With the Titanic 100th anniversary quickly approaching, many individuals are asking questions about the Titanic and her short life. From keel to completion, the Titanic was speedily built and appeared to be unsinkable. The modern marvel of engineering and luxury may have seemed like a flawless vessel, but many question its integrity and the integrity of those who oversaw the construction. Whether or not the building of the Titanic was the best it could be is not of any importance, what is important is the remembering the legendary vessel, those lost during its sinking, and the idea of the largest unsinkable passenger ship every to have been built. I just love ships and the titanic ship movie was my favourite yet so SAD. I like the titanic movie but it brings me to tears thinking of all those lifes gone underwater without a last goodbye from there family knowing they will never see them again. Previous post: Who Discovered the Titanic, and When? Next post: When Did the Titanic Sink?